I saw Oberhofer play live at Rough Trade East last week. It was a small showcase set of about half an hour and they impressed the hell out of me. 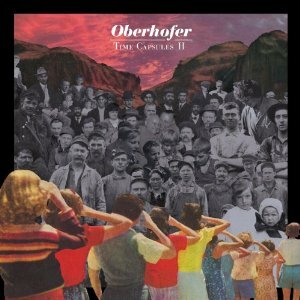 Oberhofer is essentially NYU ‘Music Theory and Composition’ graduate Brad Oberhofer (his actual name) and, off the back of a couple of Eps, they’ve already caused a bit of a fuss. This, their first UK (free) live show heralds the beginning of a short UK tour. Oberhofer’s live act is fast and furious and the songs are incredibly infectious. Brad Oberhofer is a born frontman and his onstage antics are as energetic as the band’s music. There was leaping off drum kits, playing from the rafters and enough twitchy guitar-rock-spasm to put even the most seasoned punk band to shame. Their musicianship was phenomenal. I watched a small group of spectators become a fairly sizeable crowd as the set went on, culminating into a full scale gig by the end of it. However, this is not a live review. At the time I saw Oberhofer live I had no idea of their sound or their tracks; after the set, I knew I had to hear their album. Which is where their first full length record ‘Time Capsules II’ comes in. The main thing to note is the somewhat surprising appointment of Steve Lillywhite on production duties. That seems like overkill for a small indie band’s first album (being the man behind U2, Morrissey, Simple Minds etc.) but Oberhofer are clearly being armed to the teeth with all they need to crack the mainstream. Their album is quite different to their live act. Obviously all of the tunes are intact but there is an element of Lilywhite’s ‘everything turned up to 11’ presence which stifles their sound. This is of huge concern. The vocal is more pronounced than the band (complete with mildly annoying reverb) and some of the subtler elements of their music are drowned out completely in an effort to MAKE IT LOUDER. A keystone of almost every track is the crowd-pleasing choruses which feature that very satisfying ‘Ooh’ sound. It worked for Coldplay and Kasabian, so what could possibly go wrong? For the most part, it’s fine, but towards the end of the record it can be a little draining. The saving grace is that it forms a trademark sound to the album and makes every track instantly recognisable as Oberhofer (a handy mnemonic, perhaps). You can almost picture the sea of mobile phones held aloft at festivals across the world, with every man and his dog getting involved in the big ‘Ooh’ chorus. It’s rousing stuff but it does detract from the talented (and varied sounding) act they actually are. This isn’t a band as laddish as their choruses might suggest. There are a huge amount of instruments included in many of the tracks. The standard four-piece guitar/drums arrangement is obviously present but we also have piano, strings, xylophone and all manner of percussion, often in the same track, at the same time. As an aside, Matt Scheiner on lead guitar is stunning as part of the live act (almost approaching Thurston Moore heights of playing), although sadly none of his talent is here for consumption; not in a recognisable form, anyway. Admittedly, live act aside, this does make for an amazing mix of noise, but it does sometimes feel a little too much for its own good. For the simpler songs it almost always detracts, which is a real shame. ‘Heart’ is the the perfect opener. Slow building with delicious piano parts, you could be forgiven for thinking this is (more recent) M83. Lyrically, the central theme of the record is of losing love and the struggle to find it again. It’s not sung with any particular passion (it doesn’t feel like there is much room for it) but the content suits the punk-pop aesthetic, without being too throwaway. Second track ‘Landline’ is a full-out indie anthem, with tons of guitar layers and a chorus so catchy it will stay with you. It actually reminded me of early Idlewild, circa ‘100 Broken Windows’. I’m sure it’s a single waiting to happen. ‘I Could Go’ is another catchy chorus, using big vocals and repetition to build the track. It’s infectious stuff. ‘Yr Face’ is much slower, almost approaching ballad territory. However, what starts as something gentle and low key builds to a huge raucous ending, which really isn’t needed. ‘oOoO’ is the centerpiece of the record (a previous single) and is no doubt their defining track as a band so far. It’s a lovely pop record, played out in the obligatory three and a half minutes. Drums are immaculate, followed by keyboard harmonies and xylophone. As the chords change it gets louder and louder, but sadly it becomes something so huge it almost struggles to regain its shape. My main issue throughout the whole record is the vocal, which is produced in exactly the same way for every track. Case in point would be ‘Cruisn’ FDR’, which is a nice little Beach Boys homage, with vocal harmonies and surf guitar rhythms. Yet due to the vocal mix it just comes off as generic. ‘Gold’ returns to the big singalong chorus angle, with the occasional piano solo, but again being drowned out for yet more guitar. Penultimate ‘Haus’ is probably the first we hear of Matt Oberhofer’s guitar work, before it’s removed by the vocal. Initially sounding like something of a nod to Vampire Weekend, again it dissolves into the mire of what has preceded it. I can’t help but think Oberhofer have had a lot of their ideas trampled in a bid to make them sound ‘loud’ and that Steve Lillywhite has hugely overcooked this. ‘Time Capsules II’ bears almost no resemblance to the live act I saw. This is a huge shame as they were one of the most promising bands I’ve seen in a long time. I have no doubt once their name gets around from the tour, this album will be a huge success for them. My only concern is that, had they applied the rule of ‘less is more’, it could have been so much better. This entry was posted in Oberhofer and tagged Glassnote, Oberhofer, Time Capsules II by admin. Bookmark the permalink.